After making my debut in last year's Marmotte and after another very enjoyable weekend with Alp Cycles I signed up for the same trip again during those cold winter months determined to better last year's time. Signs: Fully supported/guided by motorbikes and support cars. This is the third year I've done a trip with Alp Cycles and judging by the number of familiar faces again this year, they are definitely doing something right. After making friends with some of the guys on last year's trip. 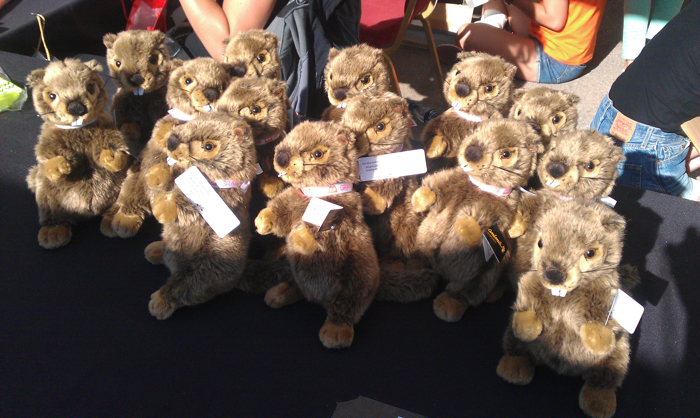 We set-up a Marmotte 2013 Facebook group as a way to stay in contact and monitor each other's training, this provided the necessary motivation to get out there and train on those cold winter days. The people I had spoken to said you need to ride The Marmotte at least once just to get a feel for the event to comprehend the climbs and descents. With that in mind my plan was to try and take it steady on the climbs and hope to get in good groups on the two 'flat' sections all the time with one eye on The Alpe. I like to mix things up a bit so after borrowing a bike last year I had my own trusty steed back for this year. However I opted to use a bike delivery service to transport my bike from The UK. If all went to plan my bike would arrive on Thursday and immediately after the event I would drop if off and it would be returned to England for Monday. All I had to do was remove the pedals. For the same price as hiring a box and paying additional baggage fees I thought it had to be worth a go particularly as my bike never quite feels the same after I've put it back together and I don't have much confidence in the baggage handlers at the airports. Flying out early morning on the Thursday before the event, it was quite nice not having the stress of checking my bike in at the airport, wondering if I would ever see it again in one piece. Although I now had the burden of wondering if my bike would be delivered in one piece. Arriving in Lyon I was greeted by Ade, one of the owners from Alp Cycles, looking worryingly lean this summer and as usual with a big grin on his face. 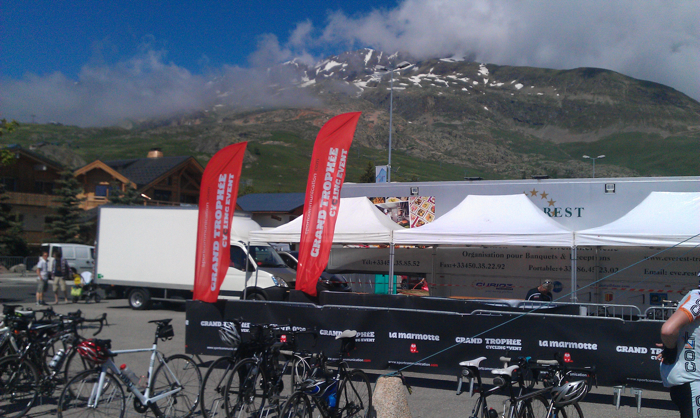 He'd upgraded the van for the transfer this year and we had a coach deposit us atop Alpe D' Huez. The transfer took just over two hours most of which were spent snoozing. I knew we were getting closer to the cycling Mecca of the Tour De France as cyclists began to line the roads and then we were on to The Alpe itself. 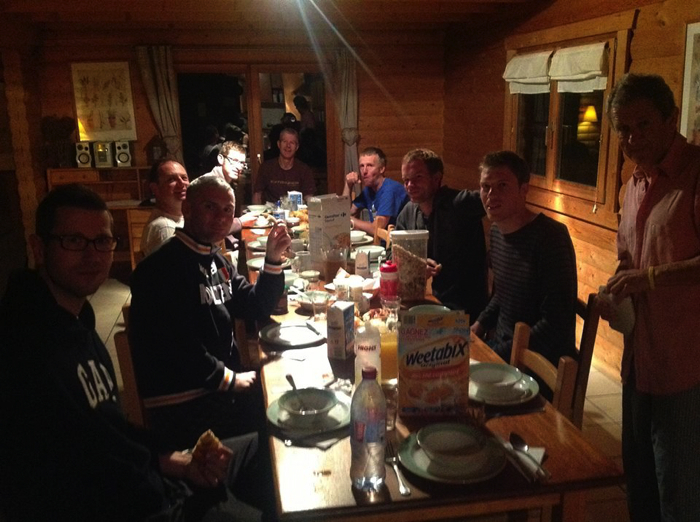 It was nice to recount tales of last year with the other guests as I began to have flashbacks of last year's event whilst the coach weaved its way around cyclists toiling on the steep lower slopes, before we arrived at our base for the weekend, Chalet Telemark. I'd also forgotten how good the Alp Cycles afternoon tea was - tucking into a huge slice of strawberry jam and coconut cake. They know what cyclists like! I know Alpe d'Huez fairly well these days, so headed up to the registration area to register and had a look around the expo area, before returning to the chalet for a hearty dinner which included a delicious risotto and what I think is called a Ballotine of chicken and another juicy pudding. All I needed now was my bike which I was assured would be arriving later after dinner. Over dinner that evening, which was again excellent, a hearty lasagna. Ade took us through the route, explaining the harder parts including where we could make time savings and also where the Alp Cycles feed stop would be - with any extra kit we wanted to deposit in the van as well as copious stocks of food. Ade's motivational speeches are somewhat legendary for me as he reminded us just how hard the whole route is. Ade explained the importance of not setting off too quickly and always trying to keep something in reserve for The Alpe. 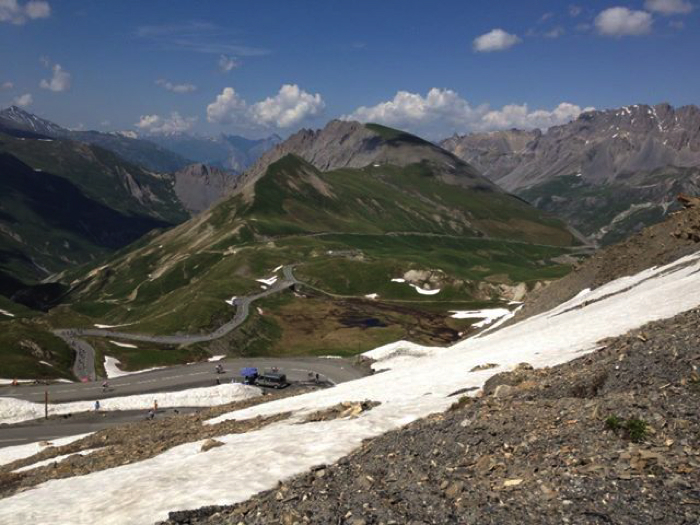 He also reminded us that the upper slopes of The Galibier are "disgustingly steep" and that by the time we arrived at Alpe D'huez our "feet would feel like the cleats were drilled into them". There was one final piece of advice as well, "tomorrow is going to be scorchio" which I took to mean very hot. Breakfast would be available from 4:30am in the chalet and it was quite entertaining seeing bleary-eyed riders appear for breakfast each with his or her own pre event routine. 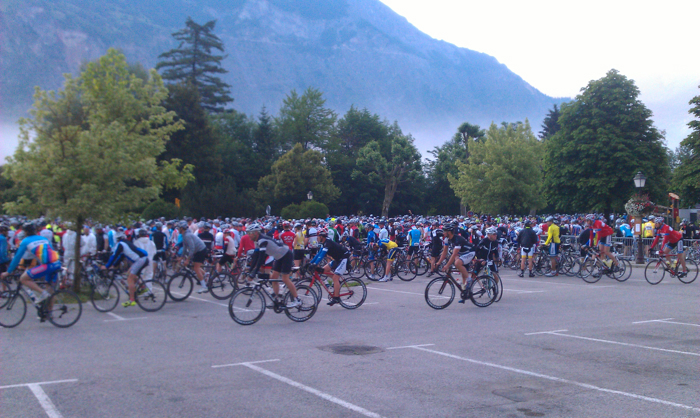 Shortly after 6:15am several of us made the chilly descent down Alpe D'Huez to the bottom where we deposited layers in our own support vehicle, with Ade handing out bin liners as we made our way to the start line. 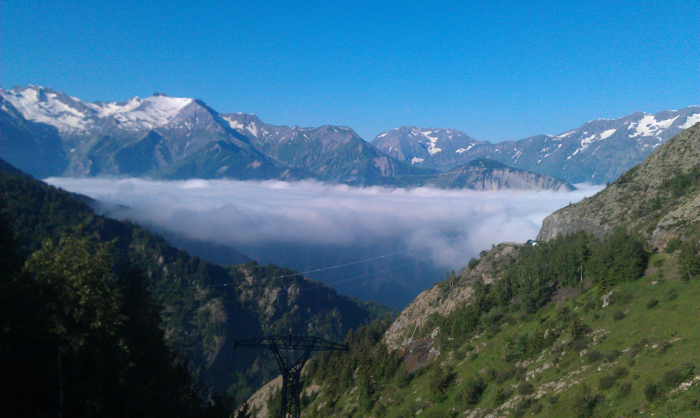 Shortly after 7:30am we all departed in the second wave and headed along the valley floor towards the first climb. I decided this year that I would try and stay with the Orange Alp Cycles train. From the off this is a very fast section of road with large groups and lots of road furniture, it is really good fun as long as you are careful! I've ridden all the climbs before so it was quite nice knowing what was coming as we got on to the steeper lower slopes of The Glandon, although I'd forgotten how long The Glandon is as I decided to push on - which I think I probably paid for later. There is a short descent and then a very steep section. The climb then opened up nicely as the morning sunshine began to light the roads. I felt pretty good and met Max and Patrick at the top, two guides from Alp Cycles. The Feed Stop at the top of The Glandon was pretty hectic as riders battled to fill their bottles and grab a banana or two. I didn't hang around for long before descending. The top of the descent is very technical and this section of the course is actually neutralised from a timing perspective due to accidents in the past. But in reality no one pays attention to this. Once over and around the first few hairpins it does open out but caution needs to be taken with thousands of other cyclists descending at times into quite narrow sections of road. I passed three ambulances on the descent which was a timely reminder to take care. The drag up to St Michel de Maurienne is a forgotten part of the course but in reality is quite long, blustery and hot on a main road. I found a nice group initially, but with no one willing to work together the pace began to slow so I joined four other riders - our own mini breakaway. This was a good opportunity to take on water and food before the next climb. Coming into St Michel de Maurienne, I remembered the town from the previous year as we turned right over the bridge and hit the Col Du Telegraph which is the easiest of the climbs on the route at 12km with an average of five or six percent. However rising up through the trees in the morning heat I found it hard as each kilometre marker seemed to read seven or eight percent but the views of the valley below are truly magnificent. I didn't stop at the water stop at the summit, instead opting to continue down the four or five kilometre descent to Valloire before a steep ascent to the second main feedstop. Plentiful supplies of water, fruit juice, cakes, sandwiches and sweets were on offer. I basically ate as much as I could and filled my bottles again before continuing along The Galibier. The Galibier is a killer of a climb with over 10km above 2000m, it heads straight along the valley on what looks to be flat roads but in reality is eight percent before turning and winding steeply up through the mountains. The views on offer are truly spectacular as you catch a first glimpse of the weather station reflecting the sun at the summit, and an army of cyclists weaving their way up the slopes like ants but this year the last two kilometers were painfully steep as cramp began to set in. There was also the plenty of snow on the roadside from a particularly long and cold winter in the mountains. Alp Cycles had strategically placed their van at the bottom of the Lauteret so I didn't hang around and headed straight down. Again once over the first few tight bends the descent really opens out and I arrived at the van to be greeted by Ade who filled my bottles and was handing out hugs on request not to mention some nice sandwiches. It was a welcome relief to get off the bike and talk to someone before heading off. I joined an extremely fast group heading towards the last climb of the day. This section of the course goes through several tunnels, which are dark and potentially quite dangerous so caution needs to be taken and the organisers this year had supplied riders with LED lights although they did seem to be lit better than previous years. I had been expecting to take food and water on again on this stretch but I was working so hard just to stay in the group that I didn't. Again this section is often thought of as downhill but in reality it is pedalling most of the way and there is a section which rises up and really saps the legs. 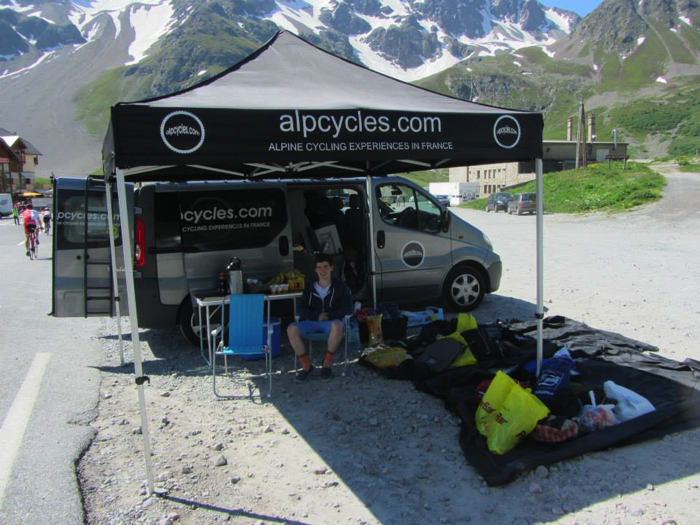 By now it was like cycling into an oven and as we arrived at the final feed stop at the bottom of The Alpe I had the words of Ade from the previous night reverberating around my head. My feet certainly did feel like the cleats were drilled into them. 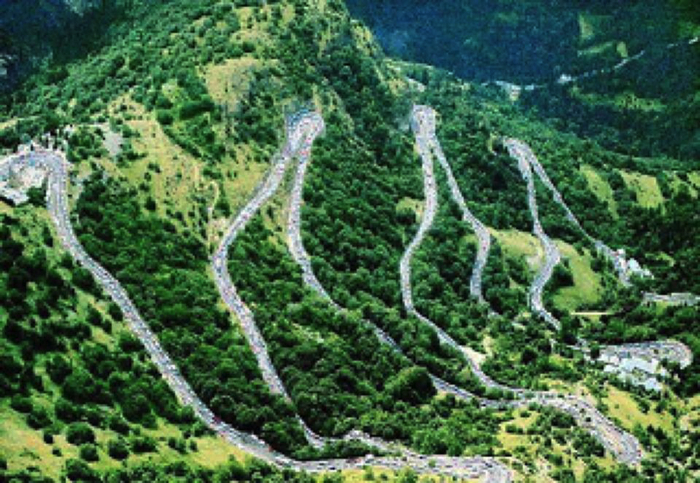 The sign to the finish reads 13km, Alpe D'Huez is a hard climb let alone with 100 miles in your legs and always blisteringly hot, particularly at the bottom. One rider claimed his LED watch had melted, I'm not sure if he was joking or not! It was 38 degrees C as I hit the first five of six ramps which are really steep. I'd definitely overcooked it earlier in the day and at this point I just wanted to finish. I was so tired that I couldn't even work out how many miles I had to go (about 6). As the number of the hairpins counts down and Alpe d'Huez came into view it was a nice feeling knowing I was going to make it. Spectators handed out cups of water and poured it over riders. There was also a water stop but I just carried on, passing a number of riders with cramp or bathing their feet in nearby streams. Coming into Alpe D'Huez I didn't have any energy for any kind of sprint finish. I didn't know what to do at the end, I just sat in the shade repeating to myself that I would never ever do this event again. After collecting my certificate I discovered I'd gone 25 minutes quicker than last year and wasn't far behind two of the Alp Cycles guides, so I was pretty happy. After recovering for a while I returned to the Chalet to bask in the afternoon sun, watching my fellow riders come home long into the evening. 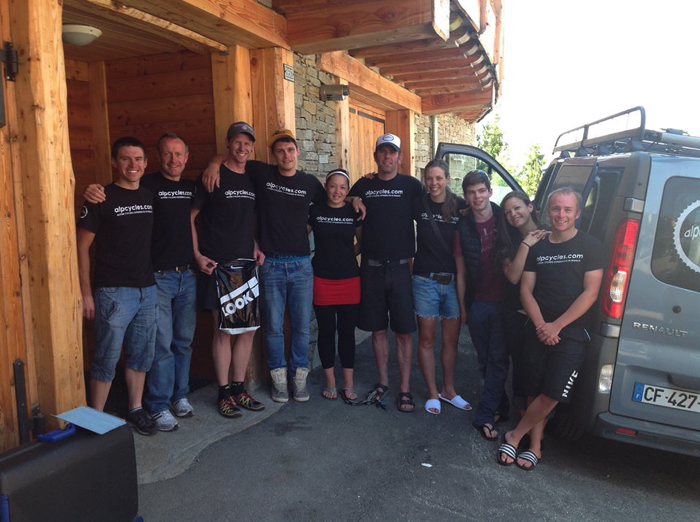 After dropping off my bike and sitting down to a great final dinner, Chilli Con Carne, it was great to hear how others had faired on the route and how we'd all found it tough going, with most suggesting they would be back for more next year. It was interesting listening to the views of the legendary Mark Lovatt who was also a guest and rode the event, rather quickly I might add. 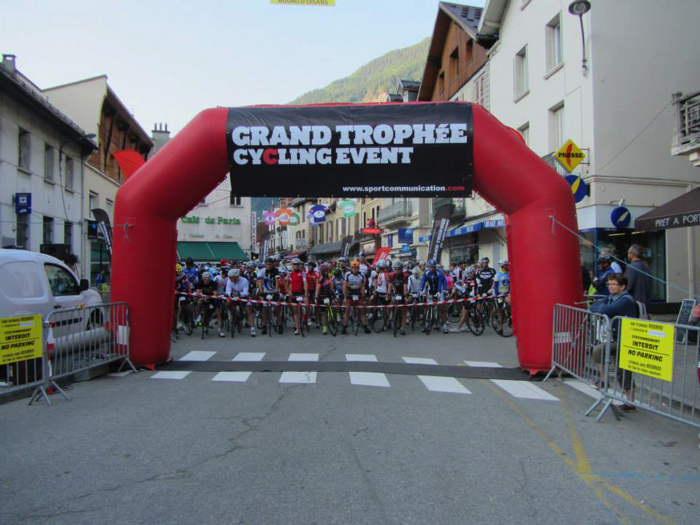 Thankfully as I'd deposited my bike I had a ready made excuse for not riding the The Grimpeur the following morning, instead I opted to watch the mass start time trial up Alpe D'Huez. Maybe next year! I really enjoyed my weekend again and doing it through a provider like Alp Cycles is a great way of doing the event as they handle all the logistics and entry into the event for you. The food was really fantastic and they catered for your every need all weekend. As well as being reasonably priced you get to meet and chat with like-minded people about cycling throughout the weekend, it is akin to being on a holiday with friends but you don't have to worry about organising anything yourself which is the kind of holiday I like! They are a really friendly bunch as well. Immediately after the event I vowed I would not be back but I'm sure I will definitely be back for more!